I’m willing to bet that a good number of you own a pair of skinny jeans. Or multiple pairs. Are you starting to feel a little bored with your skinny jeans and need some outfit revival for this wardrobe staple? Um, same. 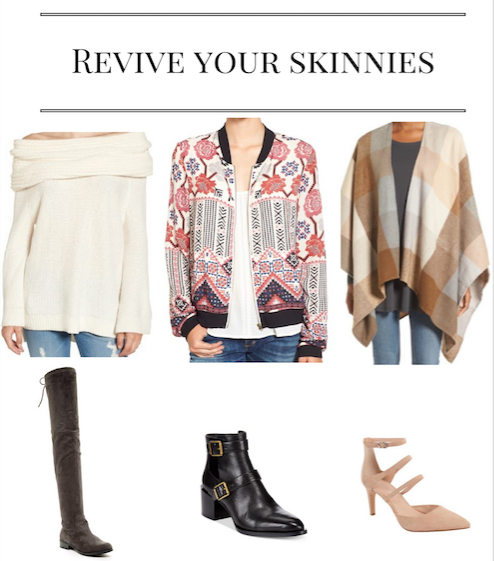 I’ve put together a few outfits that will revive the life of your skinny jeans this fall. As fall weather approaches, we must rely on our skinny jeans to be the perfect mate with cozy sweaters, over-the-knee boots, or a suede pump to go out on the town. I always make sure to have a solid pair of black, dark wash, and a distressed pair of jeans. The best fit for skinny jeans, in my opinion, are those that hug the leg like a legging. If I try on skinny jeans that don’t hug throughout the knee, it’s gonna be a *no* for me. Since I wear skinny jeans in the fall with boots all the time, I like there to be no bagging around the top of taller boots and a smooth fit into my booties. Fit: make sure it’s right for YOU; sometimes what’s cute on other people might not work on your body type – story of my life! Be dedicated to finding the best fit, don’t settle. Some of my fave jeans brands are: Madewell, Flying Monkey, AG Jeans, Wit and Wisdom. Price: make sure the fit and quality of the jean are worth what you’re paying, You pay for what you get with jeans, so make sure that the quality of the jean matches the price fairly. And now…the revival of your trusty skinny jeans lie below. Try adding in these pieces to your outfits with skinny jeans, and those skinny jeans will be never be on your hanger again! Okay this is GENIUS. I’m obsessed with the off-shoulder trend (is it obvious?) and now this favorite trend has married to another favorite of mine: sweaters! The off-shoulder sweater makes a look that is so elegant but also casual enough to run around town in too if needed. Add in an OTK boot (this pair is on sale and in 4 great colors – check them out!) and you’re set with a simple, easy 3 piece outfit to rely on throughout this season. Channel your inner Kendall Jenner and Gigi Hadid by making this pairing happen for you. Get warmth and that ultimate cool-girl vibe from your bomber jacket while looking totally bad-a with the moto booties. I’d definitely say throw in a black or dark wash distressed jean for this look. I mean, this outfit is making me cozy just writing about it. Can someone light a fire? Wrap yourself up in a comfy poncho over a long sleeved tee with a pair of (comfy) pumps for an elevated but comfortable look. You could easily throw on a pair of booties for the day and then put on the pumps for an evening out for dinner. Throw in warm, brick red lipstick to complete the look.